Ahead of a landmark foreign policy speech on Iran Monday morning by newly installed Secretary of State Mike Pompeo, his first since taking the office, European nations have been locked in meetings to develop contingencies to continue doing business with Iran after new U.S. sanctions go into effect in the coming months. European Union members are seeking to reimpliment an old law known as the blocking statute, which orders European companies to ignore U.S. sanctions on Iran. The move sets up a showdown between the United States and Europe over the future of business dealings with Iran in the wake of President Donald Trump's decision to walk away from the landmark nuclear deal and reimpose wide-ranging and severe sanctions on the Islamic Republic. Iran opponents on Capitol Hill are already moving to respond, according to multiple sources who shared with the Free Beacon a newly developed policy memo that maps a plan for the United States to potentially sanction the European Investment Bank, or EIB, and cut its access to the U.S. financial system. The policy paper was written by Richard Goldberg, a senior adviser at the Foundation for Defense of Democracies. "There is no statute that can save a European company from losing its access to the U.S. financial system," the policy memo states. "European companies will not be willing to violate U.S. sanctions even with the revival of the blocking statute." European companies will be forced to make a choice between doing business with Iran and retaining access to the U.S. financial system. "French President Emmanuel Macron Thursday conceded that European companies should be allowed to decide for themselves what to do without an EU order," the memo notes. This suggests that whatever blocking statute is announced Friday will be largely symbolic. The Trump administration could invoke the 2013 Iran Freedom and Counter-Proliferation Act, a wide-ranging law that could be interpreted in such a manner that would sanction European companies for providing material support to the globe's foremost state sponsor of terror. The law "requires the president to block the assets of any person who knowingly provides financial or material support to any activity related to Iran's port operators, its energy, shipping, and shipbuilding sectors, and any Iranian company or official listed on Treasury's Specially Designated Nationals list," according to the policy memo, which is being examined by multiple offices on Capitol Hill. "The Trump administration could interpret this section to apply to any EIB director who votes to provide such support—and to any member of the Management Committee who implements it." 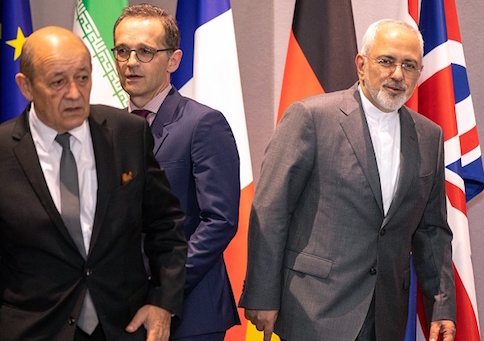 Administration insiders familiar with the United States' efforts to ensure European nations cut ties with Iran told the Free Beacon the EU is fighting a losing battle to counter new U.S. sanctions. "The Europeans are acting more like a Heaven's Gate cult, locking arms and willing to eat the apple sauce rather than break off business with the world's leading state sponsor of terrorism," said one source familiar with the strategy. "Treasury this week designated the governor of Iran's central bank—does any European country think Treasury can't designate their own central bank governor too?" In his policy address, Pompeo will lay out a strategy to reimpose harsh sanctions on Iran and force it back to the negotiating table to ink a new nuclear agreement that covers much more than the original accord, including Iran's proliferation of weapons across the region and its buildup of sensitive ballistic missile technology, according to senior State Department officials. "This will be the secretary's first major foreign policy address," Brian Hook, director of policy planning at the State Department, told reporters. "He has decided to make that on Iran. And we will be discussing our vision to address Iran's nuclear program, which has had a definite military dimension to it, and the Iranians have yet to come clean on the military dimensions of their nuclear activities." "We don't believe that Iran has earned the trust of the world to have restrictions on its nuclear program lifted," said Hook, who had been spearheading talks with European allies on tightening the nuclear deal. The administration believes that sanctions are key to bringing Iran back to the negotiating table, according to Hook. "By reimposing the sanctions that were lifted under the JCPOA, that will bring economic pressure to bear on Iran," Hook said. "It was economic pressure that brought the Iranians to the table a few years ago. We very much want a diplomatic outcome, one that is going to increase the security of the American people. We thought that the JCPOA provided too much in return for too little, and we also thought that it had very strong deficiencies." "The goal of our effort is to bring all necessary pressure to bear on Iran to change its behavior and to pursue a new framework that can resolve our concerns," Hook explained. "And that's what we're going to be discussing."